Hair growth occurs in a cyclic pattern. While the pattern of growth for each individual hair is identical to that of all of the surrounding hairs, individual hairs progress through the cycles of growth at different times. At any given time, most hair is actively growing. However, approximately six to eight percent of hair sheds each day, according to the American Hair Loss Association. 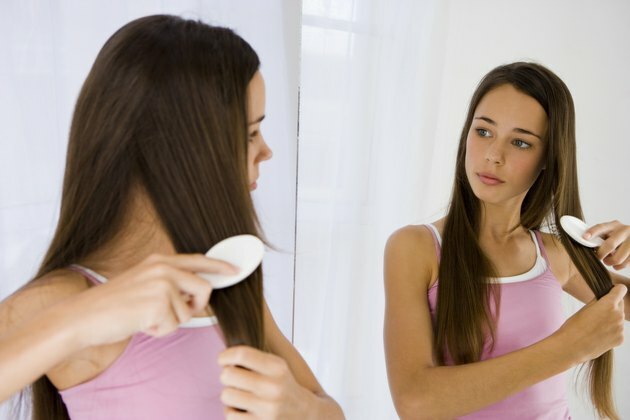 When the number of hairs shed outpace the number of actively growing hairs, hair loss occurs. Once hair loss occurs it can take months for hair to grow back, and the growth does not always look encouraging. On close inspection, those with dark hair may be able to discern a shadow or dark spots in their hair follicles. Shadow indicates that hair follicles have entered into the anagen, or active, phase of hair growth. At the beginning of the phase, hair follicles reform and start creating the hair root bulb. Keratin and color pigment cells intermingle and accumulate, forming what will become the hair shaft. The presence of the color pigment cells and the hair shaft under the skin accounts for the shadow. The presence of downy hair, or peach fuzz, indicates that substantial growth can occur. Even though the fuzz may appear fine, sparse, weak and discolored, it points to future growth. Many people notice that growth during this phase is colorless or very light. This is due to slow color pigment cell formation. While the color usually returns, sometimes it never does. This is especially true in people with alopecia areata, an autoimmune condition that causes small, round bald patches. Fine, short hair growth is a very encouraging sign. The fragile nature of the hair during this phase of new growth requires gentle care. Some are able to use the hair to camouflage their bald spots. A few months after the first signs of growth, hair becomes sturdy. Hair grows approximately 1 cm every four weeks, according to the American Hair Loss Association. As a result, it can take quite some time to grow the new hair out to a longer length. Do Hair Follicles or Hair Cells Die Completely?